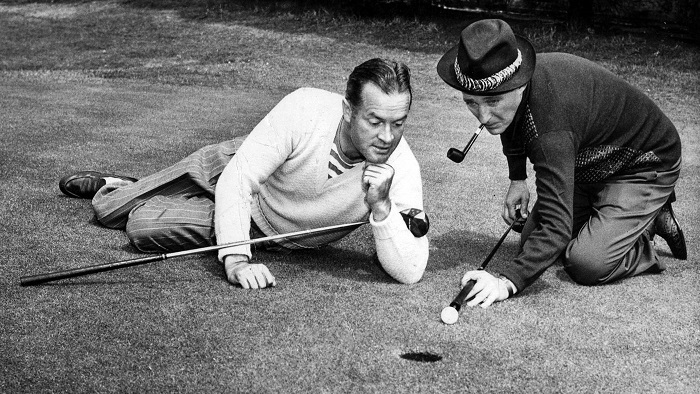 The PGA Tour itself has been known by several different names throughout its almost 90 year history. It was formed in 1929 and was initially run by the PGA of America. In the late 60’s sponsors began to pony up larger purses for various events and a dispute arose between the players, who felt they deserved the lion’s share of the new money, and the PGA of America, who wanted the cash to promote golf at the local level. Ultimately the touring professionals broke free from the club pros and formed a new entity – the Tournament Players Division, which eventually morphed into the PGA Tour. If you look at the records of players from the 30’s, 40’and 50’s, you will see a preponderance of titles with names depicting the host city or state: Shreveport Open, Texas Open, Miami Invitational etc. In the 60’s, when sponsors gained more leverage with larger purses, names began to reflect a combination of the sponsor and location, such as the Canon Greater Hartford Open. Some events went through a phase where Hollywood celebrities were added to the mix but in recent years, it’s all about the sponsors, which leaves many scratching their heads wondering where their favourite events have gone. Chances are the tournament hasn’t gone anywhere – it’s just operating under a different name. See if you know the answers to the following trivia questions about various events. 1. Where are the Hall of Famers? For all of the Hall of Fame golfers that have played on the PGA Tour, it’s odd that only two have tournaments named for them. Can you name them? Three additional tournaments are closely associated with Hall of Fame players. Do you know which ones? Throughout the history of the PGA Tour, singers, actors and comedians have been associated with various tournaments, mostly in the 1970’s and 80’s. In total, there have been 11 entertainers that have had their name incorporated with a tournament name. How many can you get? No player has managed to win all of the entertainer affiliated events, even if you exclude the Timberlake tournament, which was played in a different era. Which player won the most titles with entertainer names and how many did he win? A PGA Tour event was contested in Tucson, Arizona from 1945 until 2006. During that time, the tournament went through 15 names changes: Tucson Open, Tucson Open Invitational, Home of the Sun Open, Tucson Open Invitational (again), Dean Martin Tucson Open, NBC Tucson Open, Joe Garagiola Tucson Open, Seiko-Tucson Match Play Championship, Seiko Tucson Open, Northern Telecom Tucson Open, Northern Telecom Open, Nortel Open, Tucson Chrysler Classic, Touchstone Energy Tucson Open and Chrysler Classic of Tucson. Two Canadians won this tournament. Can you name them? The John Deere Classic started life on the PGA Tour in 1972 as the Quad Cities Open. What are the four cities that make up the Quad? At one time, the following tournaments were popular Tour events but are no longer on the schedule even under other names. Do you know where they were played: Tam O’Shanter Open, Esmeralda Open, Dapper Dan Open, Carling Open? BONUS QUESTION. Where was the B.C. Open played? 1. Arnold Palmer Invitational and AT&T Byron Nelson. 2. Ben Hogan, Jack Nicklaus and Bobby Jones. The Fort Worth Invitational is closely associated with Hogan, who was a long time Fort Worth resident who won the tournament five times. The Memorial Tournament, which is played on a Nicklaus-designed course, Muirfield Village in Dublin, Ohio, is considered Jack’s Tournament because he started the event and is the annual host. The Masters was founded by Bobby Jones and Clifford Roberts. Even though none of the three has their name on an event, each is synonymous with their respective tournament. 3. All of these tournaments are still played on Tour today under different names. Justin Timberlake Shriners Hospital for Children Open (2008-12). 4. Johnny Miller is king of the Hollywood slam with a total of 9 victories. He has a Bing, 2 Deans, 2 Bobs, a Jackie, Joe, Glen and Andy. After the name was changed from the Bing Crosby National Pro Am to the AT&T National Pro Am, Miller won two additional titles plus he added another Tucson Open when it was neither a Dean nor a Joe. Obviously, they’re official wins on the PGA Tour but don’t count in the Hollywood Slam. Tom Watson has the second most titles with 7. 5. George Knudson won in 1968 and Ian Leggatt won in 2002. 6. It’s a trick question. For some strange reason, there are actually five cities involved: Davenport and Bettendorf in Iowa and Rock Island, Moline and East Moline in Illinois. Canadian Dave Barr won the event in 1981 in a playoff over four other golfers including Canadian Dan Halldorson. 7. The Tam O’Shanter Open was also known as the All American Open. It was played from 1941 to 1957 at the Tam O’Shanter Country Club in Niles, Illinois. Byron Nelson won the event four times. The Esmeralda Open was only a PGA Tour event in 1945 and 1947 and was named for a laughing horse that was the symbol of a local sporting club in Spokane, Washington. Nelson won the event in 1945 as the 16th of 18 tournaments he won that year. The Dapper Dan Open was sponsored by a local Pittsburgh charity in the 30’s and 40’s. It’s notable because it’s reputed to be the first professional tournament Arnold Palmer ever played. The Carling Open, also known as the Carling Classic and Carling World Open was a series of events sponsored by Carling Breweries between 1953 and 1967. The tournament was held at different courses all over North America and the final event in 1967 was won by Billy Casper at our very own Country Club in Woodbridge, Ontario. 8. Perhaps another trick question. Contrary to its name, the tournament was not held in British Columbia. Rather it was hosted by the En-Joie Country Club in Broom County, New York from 1973 to 2006. British Columbia did have a PGA Tour event for several years known initially as the Greater Vancouver Open (1996-1998) and then the Air Canada Championship from 1999-2002. Golf Channel analyst Brandel Chamblee can claim the GVO as his lone PGA Tour victory while Mike Weir claims the ACC title for his first of eight PGA Tour wins.